Last month, I was thinking about Brayden taking his own lunch to school nearly every day. While children seem to tolerate the same thing over and over again better than adults do, I knew he couldn’t have the same old lunch every day. I also knew peanut products would be out (so, you know, peanut butter) since there are some students in his school allergic to peanuts. I needed some ideas! I turned to some ladies online and got a great list of ideas to add to my ideas for taking lunch from home. And today I will share the compilation with you! You can use these ideas for picnics, your husband, your children, or yourself! Hot dogs, kept in thermos to keep warm. Jelly and honey–okay, I know, this does not sound healthy. Brayden loves his PB&J, but obviously cannot have it. So sometimes he takes a honey and jelly. It is homemade jam, local, raw honey, and on whole wheat bread that I ground the wheat for myself (well, my wheat grinder did but I turned the knob). So it gives him the sense of what he is wanting and keeps other kids safe. Get a good “sack”: An insulated lunch bag is the best thing you can get if you want more than a basic PB&J and piece of fruit that dosen’t require refridgeration. The one I got for Brayden has a separate compartment–so I can keep certain foods apart. This is great if you have a food you want really cold and a food you want warm (you can also buy ice packs to put in these bags). I like to use it to keep the sandwhich away from heavier foods. I hate smashed sandwhiches. Use re-usable containers: You can use these for sandwhiches to prevent sandwhich smashing. You can also buy small containers and use them for things like dips and dressings. 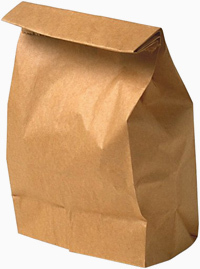 Send a treat: Sometimes sack lunch can get a “bad wrap.” I think in our school, it is kind of a trendy thing to do (to bring your own lunch), but I remember when I was in school, it was not cool to bring your own lunch. First of all, we moms can help define cool by sending cold lunch from the beginning. Second of all, who really cares about cool? lol–okay whole other post topic there. I think if you include a fun treat in the lunch, your child will be excited to bring it (or there is at least a chance). I like to send lunches because I know exactly how healthy they are or aren’t. I use a lot of homemade items and homegrown fruits and vegetables. He does eat lunch at the school some days, but most days are lunch from home. Your turn! Share what you send or take with you for lunches from home! What tips do you have for sending a sack lunch? This helps me even though all my kids are still at home. I run out of lunch ideas and end up doing the same thing each day. Thanks! My sister does the soup in a thermos thing for her daughter and my niece loves it! My sister says the trick is to heat it really hot so that it's still warm come lunch time. Also, to keep apple slices from turning brown, she puts just a little bit of lemon juice in the bag and it works like a charm. LOL Rebekka!! i seriously am laughing in my kitchen at your post!Anyways, back to lunches.My girls BEG me to buy them the disgusting LUNCHABLES (which are packaged just to attract kids). If you've ever looked in one, they are really unhealthy. So I decided to create my own LUNCHABLE 🙂 I got divided lunch containers from Target and cut the ham/turkey/cheese in squares, add the WW or Rice crackers to one section and even pickles too. The girls love them and it's really super easy. We use the same container for a cut veggies (carrots, cucumbers) dip and cheese. lol…Thanks for all of the LUNCH ideas. Fun additions. Holly, It is a way of making spinach that is more appealing to children. You can google it for tons of recipes.